The warm air and the smell of the salt water hits our faces as the aeroplane doors open and we walk down the stairs onto the tarmac. We’ve made it to Male, the capital of the Maldives and are met by our guide, Nathu before being led toward a traditional style dhoni. A few minutes later the ten of us, tired but so excited, board the Cobia surf charter, our home for the next ten days as we cruise the atolls in search of waves. The first day greets us with 3’-4’ of swell and despite our jet lag, we wake early and are in the water before breakfast for what will become a familiar routine: Surf, eat, sleep, repeat. The next few days become a happy blur of hoots, hollers, smiles and sunscreen. We dance in Devehi and share laughs with the locals as we call ‘party wave!’ again and again. Where to surf each morning is one of the most difficult decisions we have to make. Will it be Jails, Honkies, Sultans, Chickens or Ninjas? Should we snorkel or sleep in between surfs? Where did I leave my bikinis??? 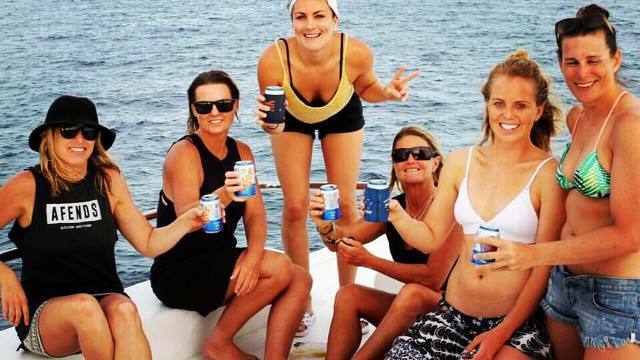 Each night we feast on sunsets over palm trees with the occasional beer or two and, after a gratifying dinner, are rocked to sleep by the surf charter boat. The last day of the trip comes too soon, so we have three more surfs before we have to disembark. We’re stoked to score Honkies and Sultans all to ourselves and our arms are spaghetti-like as we call for the boat one last time. In the timelessness of the ocean, ten strangers have fast become friends, shared memories that will last a lifetime and scored some of the best waves of their lives. What better way to spend ten days? The good news is we are doing it all again next year. 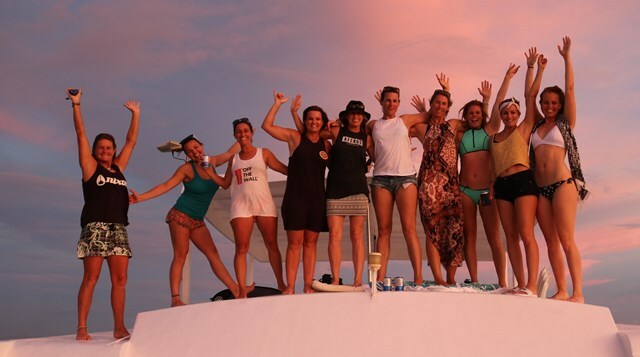 If you want to come on a fun all female surf charter with the crew from Sunshine Surf Girls Magazine and The Perfect Wave, enquire here.